Your dream come true! Extensively renovated victorian-style Bed & Breakfast w/ mass amounts of history. EVERYTHING is included! Located in the heart of the Rockies! Great potential to increase current profit/create a new business. 8 guest rooms, living quarters, lg. laundry room & spacious kitchen. Open common area w/ fireplace & 2 sep. dining areas. Quaint gift shop attached & vacant land across street holding great potential! 5-Star Executive Airbnb! New boiler, water heater, roof & much more! Call LA to schedule tour. 24-48 hours notice required. Buyer could increase profit extensively by increasing rental rates & leasing gift shop. 15% residential & 85% commercial. No water/mineral rights. Septic pumped 1 yr ago. Leach field new. Sep. well house across street. 2 liquor licenses. Health inspection always outstanding. Road assoc. dues – $225/year. Confidentiality agreement will need signed to receive 17/18 financials. Buyer to verify w/ county approved uses & permitting requirements. Nature is our Backyard - Come Enjoy all the Outdoor Fun Colorado has to Offer!! 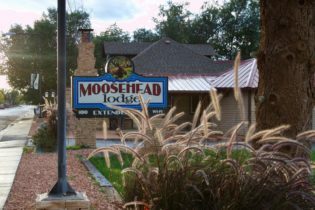 Moosehead Lodge is located in the heart of Rangely, Colorado, just minutes from Colorado Northwestern Community College where you can catch a Spartan’s basketball or softball game. Just minutes north, you can visit the famous Dinosaur National Monument with over 1,500 fossils exposed on the cliff face. Up the street is Cedar Ridge golf course, a spacious 9-hole course overlooking the Canyon Pintado. You can enjoy an ATV trail ride to Kenny Reservoir, or simply enjoy hiking the many trial systems behind the lodge. Also Rangely is a hunter’s paradise, and Moosehead Lodge is home to many of the hunters that need a perfect spot to rest their heads after a long hike in the pine-covered ridges. Moosehead Lodge would make a great bed and breakfast with the totally remodeled 2,800 sq. 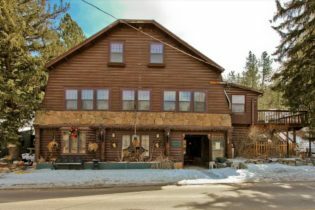 ft. house, for the innkeeper, with new flooring, fireplace, complete kitchen with new chrome appliances and 3 bedrooms. The quests have 12 newly remodeled one-room cabins with full bathrooms and all cabins are equipped with smart TVs, WiFi, brand new queen size beds, coffee, small refrigerator, microwaves, sinks, and desk. The back lodge has multiple remodeled rooms with full bathrooms, brand new queen and king size beds. All the buildings have new carpet, paint and exterior stone and paint. Located right off Main Street in Rangely and an ideal place for a one-time stay or extended stay. Property comes with 12 newly remodeled cabins, 2 newly remodeled lodges, a lobby cabin with washer and dryer and bathroom, and property on both sides of the Moosehead Lodge can be used to expand business.